Spirit Embassy founder Prophet Uebert Angel counts himself among some of the richest pastors in Africa and says he is worth $60 million and insists that his fortune is from his business empire and not the church. He is among a number of Pentecostal church leaders who seem to have easily acquired wealth over a short period of time anchored by huge church followers inspired by the gospel of prosperity in search of material wealth. Although he has not publicly declared his net worth, United Family International Church leader Prophet Emmanuel Makandiwa has also done well for himself as he is believed to personally own shares in blue chip companies as well as prime real estate especially in Harare. A spokesperson for the church has said that these are Makandiwa’s personal assets and as his career has been only in the church, there is no prize for guessing how the aggrandisement came about. Makandiwa has constructed a huge church in Chitungwiza. Prophet Walter Magaya of the Prophetic Healing and Deliverance Ministries also seems to be amassing great wealth. He recently donated a house to a destitute man in Harare, a repeat act of charity. Magaya also reportedly disbursed over $20 000 to settle debts owed by adult dancer Bev during the latter’s ill-fated flirtation with the ministry. Yet unlike the others, he eschews a flashy life and drives a simple Mazda Demio and has very ascetic tastes. But none of Zimbabwe’s big fish has made an impact in the world ocean by appearing on the international list of richest church leaders. Unless they have undeclared income and they will have to spur their followers on to reach the levels of their West African spiritual fathers. Nigeria has five names in the top 10. 1. Bishop T D Jakes: Bishop Jakes lives in a $1,7 million mansion, he has been called America’s best preacher and has been featured on the cover of TIME Magazine. He is a writer, preacher and movie producer. Thomas Dexter “T. D.” Jakes, Sr: Is the bishop/chief pastor of The Potter’s House, a non-denominational American mega church, with 30 000 members, located in Dallas, Texas. TD Jakes wears custom made suits and sports a diamond ring the size of a coin. This man of God has been endowed with a $150 million net worth. 2. Bishop David Oyedepo: Bishop David Oyedepo is a Nigerian preacher, Christian author, founder and presiding Bishop of Winners Chapel known as Living Faith Church World Wide. Has been hailed as the wealthiest preacher in Nigeria with a total net worth of $150 million and properties like four private jets and homes in the United States and England. After the foundation of the Living Faith Outreach Ministry in 1981, it has evolved to be one of the largest congregations in Africa and has a flourishing mission in Nairobi. 3. Enoch Adeboye: This messenger of God was listed in an African magazine, NEWSWEEK, as the most powerful man in Africa and one of the top 50 global power elites in 2008/ 2009, among others such as President Barack Obama and Nicolas Sarkozy. Pastor Adeboye heads the Redeemed Christian Church of God, something he has done for the last 28 years. Among his possessions are private jets. Earlier this year, Bishop Oyedepo was barred from entering the United Kingdom after his church was accused of “cynically exploiting supporters”. 4. Benny Hinn: Israeli televangelist,Toufik Benedictus “Benny” Hinn has an estimated net worth of $42 million. He is best known for his regular “Miracle Crusades” — revival meeting/faith healing summits that are usually held in large stadiums in major cities, which are later broadcast worldwide on his television programme, “This Is Your Day”. Hinn was born on December 3, 1952. 5. Chris Oyakhilome: This is the man behind Believers’ Loveworld Ministries, aka Christ Embassy. His church has an estimated net worth of $50 million. The charismatic preacher was recently at the centre of a $35 million money laundering case in which he was accused but eventually cleared of siphoning funds from his church to foreign banks. Christ Embassy, boasts more than 40 000 members, several of whom are successful business executives and politicians. Oyakhilome’s diversified interests include newspapers, magazines, a local television station, a record label, satellite TV, hotels and extensive real estate. His Loveworld TV Network is the first Christian network to broadcast from Africa to the rest of the world on a 24 hour basis. 6. Creflo Dollar: American Bible teacher, pastor, and the founder of World Changers Church International located in Fulton, Georgia. As his name suggests, this preacher’s “manna” comes in the form of the green back. Creflo Dollar is estimated to have a net worth of $27 million, most of which came from his ministerial establishments around the United States. Creflo Dollar International covenant association, Arrow records, and the Creflo Dollar ministries are jointly overseen by the popular TV evangelist and his wife. In 1984, Creflo Dollar was awarded a Bachelor degree in sciences by West Georgia College. Oral Roberts University awarded him an honorary doctorate degree in 1998. His ministry’s first ever gathering was held in a cafeteria with only eight people in attendance. In 2006, the overall cash revenue received in his church was about $69 million. His congregation has grown in leaps and bounds over the years, today his ministry boasts of over 30 000 members. His church auditorium named the World Dome was built with $18 million without any bank loans. He is the publisher of Change Magazine with over 100 000 readers around the US. 7. Kenneth Copeland: He runs Kenneth Copeland Ministries and was one of several televangelists whose finances were investigated from 2007 to 2011 by Republican Senato Charles Grassley of Iowa. According to an article by the Associated Press that ran in 2008, “His ministry’s 1 500-acre campus, behind an iron gate a half-hour drive from Fort Worth includes a church, a private airstrip, a hangar for the ministry’s $17,5 million jet and other aircraft, and a $6 million church owned lake-front mansion. The article later added that while Copeland has not released up-to-date salary statements, “the church disclosed in a property-tax exemption application that his wages were $364 577 in 1995; Copeland’s wife, Gloria, earned $292 593. 8. Billy Graham: American evangelical Christian evangelist, William Franklin “Billy” Graham, Jr., has a net worth of $25 million. The Southern Baptist evangelist rose to celebrity status as his sermons started getting broadcast on radio and television. Graham was born on a dairy farm near Charlotte, North Carolina in 1918, he has conducted many evangelistic crusades since 1948. He is now a world renowned televangelist raking in millions of dollars. 9. Matthew Ashimolowo: Ashimolowo, the owner of Kingsway International Christian Centre (KICC) gets an annual income of $200 000. Having his humble beginnings as a priest in Foursquare Gospel Church, a Nigerian church that sent him to open a satellite branch in London. Pastor Matthew had other ideas and decided to set up his own church instead. Today, his KICC is reportedly the largest Pentecostal church in the whole of the United Kingdom. His net worth has been put at $6 million and the source of his wealth comes from varied business interests including his media company, Matthew Ashimolowo media, which churns out Christian literature and documentaries. In 2009, Kingsway International Christian Centre posted profits of close to $10 million and assets worth $40 million. 10. TB Joshua: Nigeria’s most controversial clergyman is also one of its richest and most philanthropic. 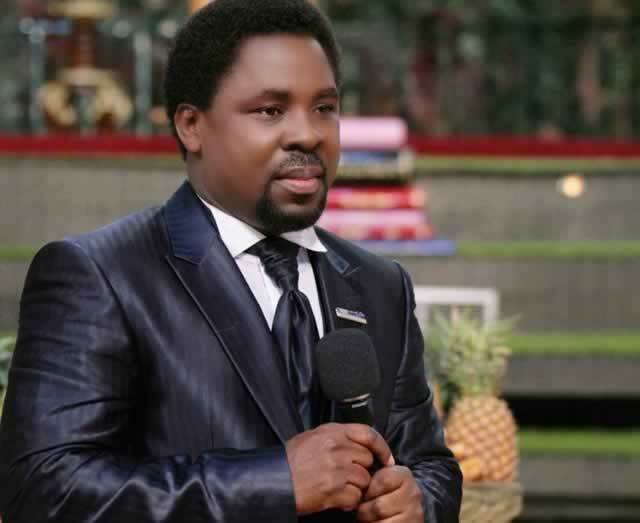 T.B Joshua heads the Synagogue Church of all Nations (SCOAN), a congregation he founded in 1987, which accommodates over 15 000 worshippers on Sundays. The Pastor has remained controversial for several years for his inexplicable powers to heal all sorts of incurable diseases, including HIV/AIDS, cancer and paralysis. He has an estimated net worth of $15 million. For miracle-craving worshippers, it’s the perfect seduction. The church currently has branches all over Africa, the United Kingdom, Asia and Greece. In the past three years, he has given over $20 million to causes in education, healthcare and rehabilitation programmes for former Niger Delta militants. He owns Emmanuel TV, a Christian television network, and is close friends with Ghanaian President Atta Mills. Cindy Trimm: No women made it into the top ten, but this one is worth mentioning. Dr Cindy Trimm has an estimated net worth of $15 million. She earned her net worth as a former senator, an author and a life coach. As a spiritual leader, she has established a multi-million dollar speaking, writing, and publishing empire that operates in several countries around the world. With her endeavors in humanitarian and business fields, she has been recognized in many countries. She has received distinctions from the Queen of England, the Duke of Edinburgh, the Governor of Bermuda, and the Ambassador of the State of Tennessee. She has been included in the “Power 100” list by Ebony Magazine as one of the most influential people currently working around the world along with Michael Jordan. She was also named an Outstanding Christian Woman of the Year. In order to address global problems, she founded the Trimm Foundation with focus on the social reconstruction as well as supports on health, housing, education, and community development initiatives around the world. Her schedule as a preacher would take her to a maximum of six countries in a month. Dr Cindy Trimm is the author of The Prayer Warriors Way as well as other books on faith and empowerment. She is also a pastor at the Embassy Worship Centre in Fort Lauderdaile, Florida. Joyce Meyer is also another rich female preacher who lives a rock star life. She employs her family members in the ministry and owns a fabulous mansion. S— VibeWeekly.com/The Saturday Herald Lifestyle.